bOX is a fairly new mobile VoIP company that is offering free U.S. and Canada calling. It's similar to Jajah in that it doesn't require a software download to your mobile device. 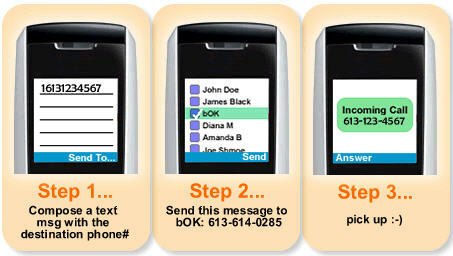 In fact, you simply text a message to bOK containing the number of the person you want to call. 1) compose a text message containing your friend's phone number. 3) pick up the phone and talk. That's it. Simple enough, right? Only drawback is if you probably have to pay for the SMS message unless your plan comes with a bucket of free SMS messages. For comparison sake, Jajah offers a browser interface to enter the phone number, so you use your "included" data plan to initiate a call instead of SMS which usually has a nominal fee per message. So it would be nice if bOK added a browser option. bOk also offers a Facebook application that adds a click-to-call link to Facebook pages allowing you to "bOK Him" or "bOK Her". They also offer international calling termination (see Rates) for a fee and use trust-worthy Paypal as the money exchange. Microsoft Lync Mobile available now! \n1) compose a text message containing your friend's phone number. \n3) pick up the phone and talk. \nThat's it. Simple enough, right? Only drawback is if you probably have to pay for the SMS message unless your plan comes with a bucket of free SMS messages. For comparison sake, Jajah offers a browser interface to enter the phone number, so you use your "included" data plan to initiate a call instead of SMS which usually has a nominal fee per message. So it would be nice if bOK added a browser option. \nbOk also offers a Facebook application that adds a click-to-call link to Facebook pages allowing you to "bOK Him" or "bOK Her". They also offer international calling termination (see Rates) for a fee and use trust-worthy Paypal as the money exchange.